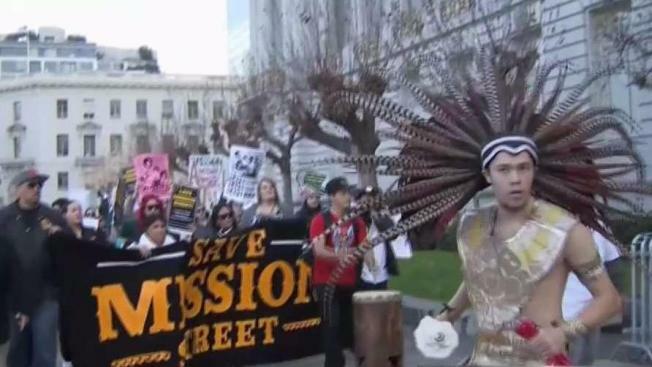 Demonstrators took to the streets of San Francisco Thursday morning to draw attention to major concerns in the city's rich cultural Mission District: protecting the remaining small business and creating more affordable housing. During the protest, demonstrators expressed their opposition to condo developments that are leading to gentrification in the Mission District. "We don't want Mission Street to become another Valencia Street where you have high-end restaurants," said Roberto Hernandez, a member of Our Mission No Eviction. "Studios in the mission cost $3,000. Families cannot afford to live here when you're making minimum wages." The people involved in the protest took their message to City Hall to get the Mayor's attention and received a response from Carolina Morales, a legislative aide to Supervisor Hillary Ronen. "We've been introducing interim control policies that create some legal protections to make sure there are a diversity of businesses," said Morales to the group of demonstrators. Morales also explained that the city is working on ensuring that incoming projects will have the highest level of affordable housing. The city is also examining programs in the Mission that help low-income people with housing that appear to be underutilized. Despite the response from the city, demonstrators say the issues are complex and will continue to protest.